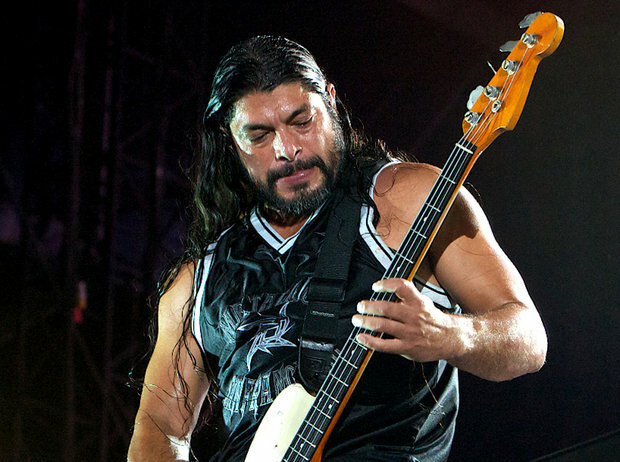 MetalRockNews: Metallica's Robert Trujillo offers advice to new artists: "Have fun, be creative, and embrace the past"
Metallica's Robert Trujillo offers advice to new artists: "Have fun, be creative, and embrace the past"
Metallica bassist Robert Trujillo was recently interviewed by Huffington Post, you can read some excerpts below. About what advice he has for new artists: "For me, the most important thing that I tell young people is to have fun. Back in the day in the music business, bands would get these multi-million dollar record deals and that was the big thing: 'We got a record deal! We got a record deal!' That's not the way it is anymore; it's about making music and having fun. "My son is eleven years old. He's an amazing bass player and a really great writer. The bass lines that he's writing and the riffs, I'm, like, 'Man, I wish I had written that.' He's coming up with stuff on his own, but he's also been influenced by players like Jaco Pastorius, but also Miles Davis or Black Sabbath or Led Zeppelin. We even listen to bands like Queens Of The Stone Age and Tool. He's like a sponge. He loves funk. He loves James Brown. He's this little eleven-year-old who's soaking up and embracing all this different music, and I can tell that it's helping him creatively in what he's writing with his band and stuff." He continued: "I would start from there, have fun, soak it all in and take a journey with this music in the past, because a lot of that stuff doesn't exist anymore. People aren't writing stuff like that anymore. Same thing with jazz. We're losing a lot of our iconic legends now; they're all at an age where we're going to be losing a lot of these people, God forbid, but with time and age, we're losing a whole generation of incredibly important, creative individuals, like Lou Reed. We lost Lou Reed, we lost B.B. King. It's starting to happen now. Health is becoming an issue with a lot of these creative powerhouses, so I always make sure that my kids are embracing music, and then bringing it to what they do and celebrating it creatively. "So, again, having fun is the most important thing. Don't make music to make money, because that's not why you should be doing it. Have fun, be creative, and embrace the past. That's a good one, because I see it a lot, and I don't want to mention any specific names in the world of music, but I see a lot of bands take this turn where it becomes almost like a spectacle on a different level. It's, like, 'What happened to rocking out?' That's why I love people like Lemmy from Motorhead. I think he's such an original in the same way that Joni was an original. The music they make is still very pure and very honest. I respect that." Trujillo added: "In a day and age when you can be influenced in so many different directions which can pull you away from your instrument, actually pull you away from physically playing, getting your fingers on strings, in these days you press a button and you can get a groove, you can get a drum beat, people don't have to play as much, and that scares me. I think that young people should embrace artists like Lemmy from Motorhead, but also be open to different styles. "I play in Metallica and I have fun in Metallica. I tell you, I am the luckiest man on the planet, because we have a good time and we're happy. When we put on our guitars we're teenagers again, and that's where the fun comes in. We really, really enjoy what we do, so that's number one, but at the same time, when I'm not necessarily doing something with Metallica, I might go jam some funk bass with my other friends. I just love playing music, real music. It's not machines. So celebrate the experience of playing together and enjoy riding that wave of creativity together because there's nothing like it."